This species is wide ranging but has experienced some declines in the Great Lakes, northern Mississippi drainage, and range edges in the west and northeast; it is most stable in the Gulf Coastal region and southern Mississippi drainage. It occurs in the Mississippian region; Great Lakes: Michigan and Erie; Mobile basin; Gulf Coastal region west to the Rio Grande system of Texas and Mexico (Nuevo Leon and Tamaulipas), and Calcacieu River system of Louisiana. Recently this species has been confirmed to be likely extirpated from the main channel of the Detroit River between Lake St. Clair and Lake Erie, Michigan/Ontario; due to zebra mussel invasion. 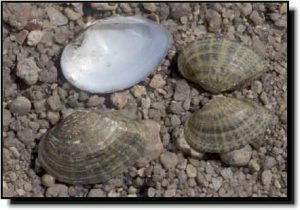 Comments: The fawnsfoot is one of the smallest mussels in Kansas rivers. The markings on the shell are striking because they look like zigzags, scribbles or wide, dark rays on a background of golden to light brown. Fawnsfoot mussels can sometimes be found washed up along the shoreline of reservoirs. The juvenile fawnsfoot produces a byssal thread it attaches to a small rock or even a nearby larger mussel shell. These act as anchors to keep this small mussel from being washed downstream. The only known host fish in Kansas is the freshwater drum, a fish well known for its appetite for small mussels. 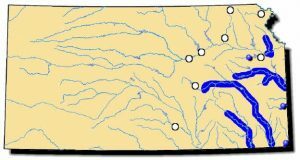 The fawnsfoot is found in the rivers of eastern Kansas.